Microsoft was looking to engage with the high school audience. We developed a unique campaign that delivered both a career-focused and product-focused message. To showcase the One Microsoft eco-system we developed a Microsoft Dorm; a contextual university/college dorm room setting which many students are eagerly awaiting. This 10’x10’ dorm room was equipped with the latest Microsoft technology spanning Windows, Windows Phone, Xbox, Surface, Office, OneDrive, Bing, and Skype. 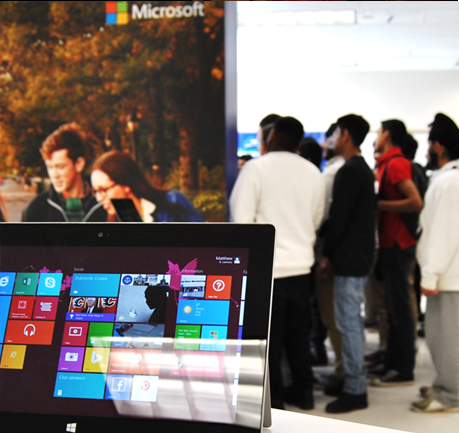 Students had a unique opportunity to attend a 5 minute group presentation, test drive the latest Microsoft powered devices, and speak directly to Microsoft representatives and members of Microsoft’s Leadership Team about career opportunities within the technology sector.